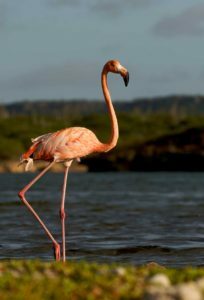 Locally known as Chogogo, the Caribbean Flamingo (Phoenicopterus ruber) has reached near celebrity status on Bonaire, where it is celebrated as the island’s national bird. Thousands of flamingos can regularly be seen foraging in the island’s saliñas. 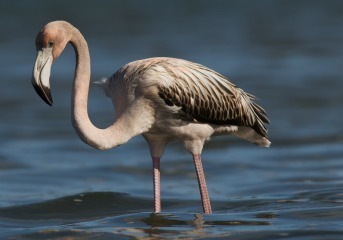 They are hard to miss with bright pink bodies, long pink legs and very long neck typical of the flamingo family. The carotene in the brine shrimp, their favorite food, is what gives the feathers their pink color. Flamingo’s are born with grey/white feathers. Over time they develop their pinkish feathers because of their diet. The image you see next here shows a young flamingo. What is less known is just how important Bonaire is to the Caribbean Flamingo. The flamingo population depends on just four major breeding sites in the Caribbean: Great Inagua, Cuba, Yucatan and Bonaire. On Bonaire, the flamingos breed exclusively in the Pekelmeer flamingo sanctuary in the south of the island, typically from January to July. Up to 3,000 breeding pairs use the sanctuary every year; females lay a single white egg in a volcano-shaped nest built from mud. The Pekelmeer sanctuary meets all the specific breeding and nesting needs of flamingos: ground that is neither too soft nor too hard, sufficient food with a high salt level, fresh water, and minimal disturbance. The salt company Cargill, adjusts the water level within the sanctuary to ensure that it is optimal for breeding flamingos. Once the breeding season is over, a portion of the colony flies to mainland Venezuela to feed in lagoons along the coast.